What can we do about Federal agencies' interpretation of Federal law? What can we do to protect Utah communities from the Endangered Species Act? Senator Mike Lee held this live VideoForum to connect with residents of Iron and Beaver Counties and to hear about issues important to them. Senator Lee answered questions from participants and spoke on issues such as Article I of the constitution and how Congress has gradually diminished its Article I power over the last 80 years. He explained that Congress has been outsourcing laws to executive branch bureaucracies. He also discussed healthcare and student loan interest rates regulated by the Federal government. 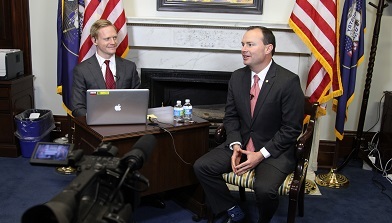 Senator Lee is a constitutional conservative and believes the federal governments' power needs to be restrained. He believes that Obamacare needs to be completely repealed, that we need to reform the criminal justice and immigration systems, and he is working hard to fix a broken federal government.